Superior Stopping Power: Today, vehicles of every size and shape have to handle a wide range of brake heat and stress. This is where our OE brake manufacturing expertise makes a difference. Wagner engineers employ the same research, development, and testing used for our original equipment business to create premium, platform-specific brake pads for the aftermarket. The result is the exceptional stopping power of new ThermoQuietTM Disc Brake Pads. The superior formulations of ThermoQuiet ensure optimal performance. 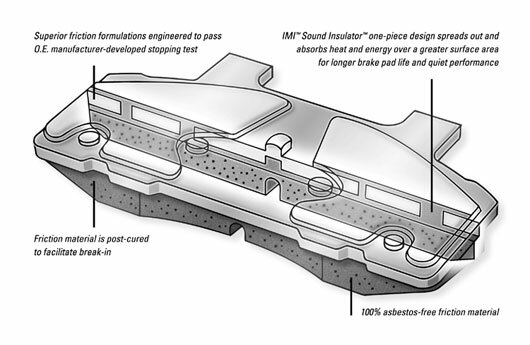 Quiet Performance: ThermoQuiet pads feature the patented* IMI Sound Insulator design which represents the next generation in shim technology. With IMI, the insulator and backing plate are one piece, not simply attached with adhesive or rivets. Vibration created during braking is, therefore, distributed over the entire width and depth of the pad. The result is the Quiet Performance of ThermoQuiet. Enhanced Durability: During normal braking, the one-piece insulator and backing plate absorb and dissipate heat over a greater surface area than ordinary pads. Heat causes friction material to break down. Because IMI dissipates more heat, this design results in a longer service life for brake components. For more information, see "ThermoQuiet" (PDF) and "ThermoQuiet Premium Loaded Calipers" (PDF).